3M have beaten all their competition to the post and announced the launch of their MPro110 pocket projector. It will go on sale this month, to be more precise the 30th September 2008. This little projector was reviewed by PopSci and the results were pretty good. Through the use of LCoS display technology the MPro110 is able to display VGA (640 x 480) resolution. 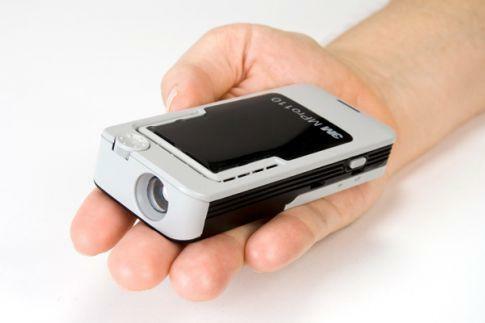 So no high definition, but considering the size it is not that surprising; no HD yet but it will not be long before there is a HD pocket projector, technology is moving very fast and the future of mobile technology is looking great. Many companies have been promising pocket projectors with exotic technologies such as lasers and microscopic mirrors or Light Blue optics with holograms, but 3M have won the day by keeping it simple. 3M have just used LEDs to light their projector which are energy efficient and don’t need a fan so the MPro110 runs nice and quietly. The LED is bright enough to be seen in a brightly lit room but few movie scenes were deemed “indecipherable.”, having said that in a dark room it could project an image up to 50-inches and so offers the ultimate cheap-o home cinema. Weighing just 0.3 lbs and measures less than an inch high, 3M’s MPro110 is perfect for travelling presenters. The 3M MPro110 will retail for about $359, it doesn’t have internal speakers but then who wants to listen to the tiny sound coming from micro speakers anyway, it is far better to use an external set.